The bright blue waters of the Aegean Sea is the perfect view from the shores of Mykonos Town, the white pearl of the Island of Mykonos. 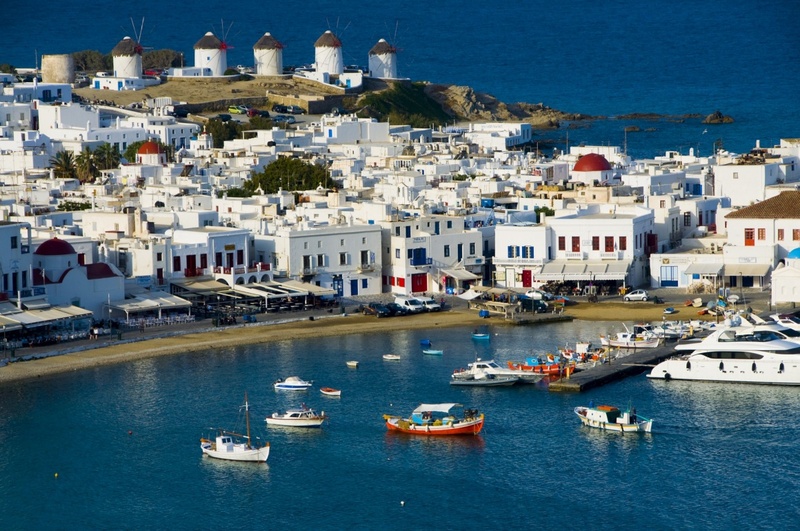 Because on many Greek islands the principal town shares the name of the island, it is often simply called “Chora,” which means “the town,” and so it is with Mykonos. The visitors to the island and town might become confused by this naming if they're not aware of it. Mykonos Town shines brightly in the sun, due to the traditional architecture with the white houses and the climbing flowering plants that grace the white structures. The narrow streets are ideal for walks and the picturesque churches and chapels are like they come out of a fairytale and charm with their uniqueness the pedestrians. The small boats make colorful punctuation to the blue waters of the port and the bright sun, lights the hearts of all visitors. Standing on a ridge overlooking the town are the famous 16th century windmills. For those who are curious about the past, the town offers an archeological museum featuring discoveries from the local islands, a museum on the folklore of Mykonos, and most especially the Aegean Maritime Museum. The museum has restored several historical exhibits so that the visitors may see them as they originally looked. By strolling through the town, you can find small cafes that provide delicious coffees and drinks. The shops in the streets of Mykonos, especially in Matoyianni street, offer special finds in unique jewelries, clothes and works of art. The travellers can end their day in the Little Venice -an area of the town, close to the sea- having dinner at a restaurant right at the edge of the water as the colours of the sunset are painting the white canvas of the houses. A greeting from the local pelicans as the sun sinks into the blue waters can be another note of a lovely visit to the heart of the island. At the night, dance in small bars or chill out in a restaurant with a jacket on your shoulders enjoying the playful wind. DO: Eat crepe with ice cream, a delicacy that is very popular in Cyclades. DON'T: The narrow streets are full of people during the high season, so if you need more privacy this is not the right time to visit Mykonos Town. Find information about selected Hotels, apartments and rooms in Mykonos Town to choose the perfect place for your accommodation.